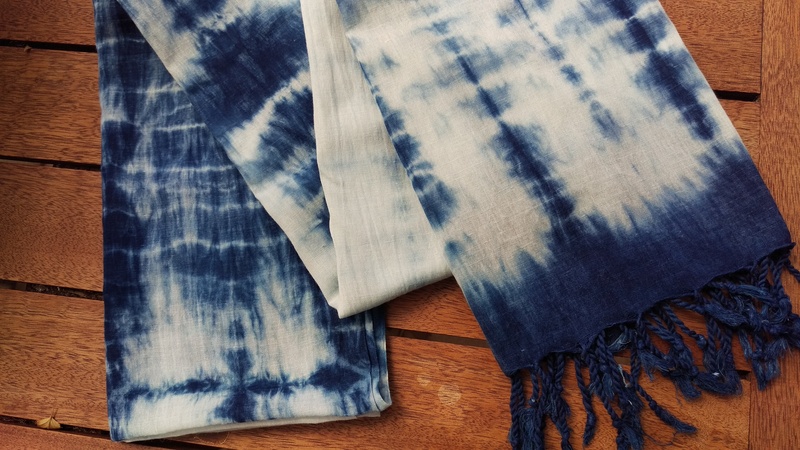 I came home from the summer dye camp at Beautiful Silks‘ Botanical Studios in Allansford determined to maximise my learning, and with an indigo dye kit in my bags. I teach for a living, and it’s very clear from watching other people learn that many underestimate the effort required to really build understanding and judgment. Not that I don’t!!! However–I try to be alert to this learning pitfall. 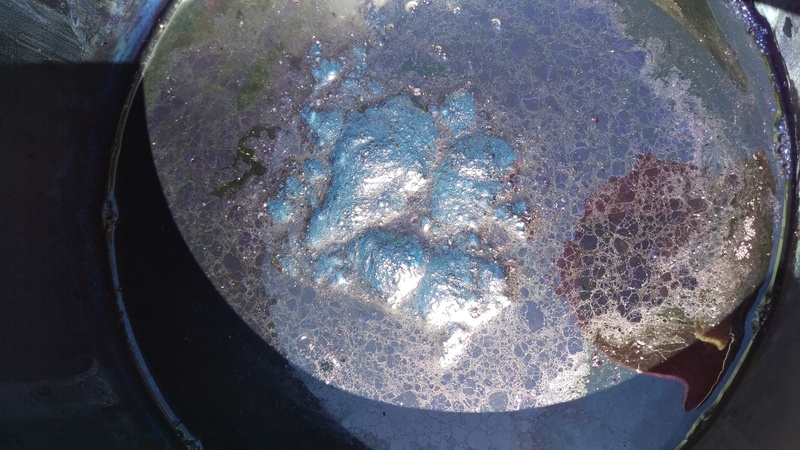 I decided that I’d make use of my last few days of holidays–and the very suitable warm weather–to try to make sure I could make use of the boost in confidence and understanding I received from Jenai Hooke in Allansford to move my dyeing forward. First step: mixing up my starter. I know–that’s what you say when you make bread. Let’s admit between us that I’ve made more loaves of bread than indigo vats. 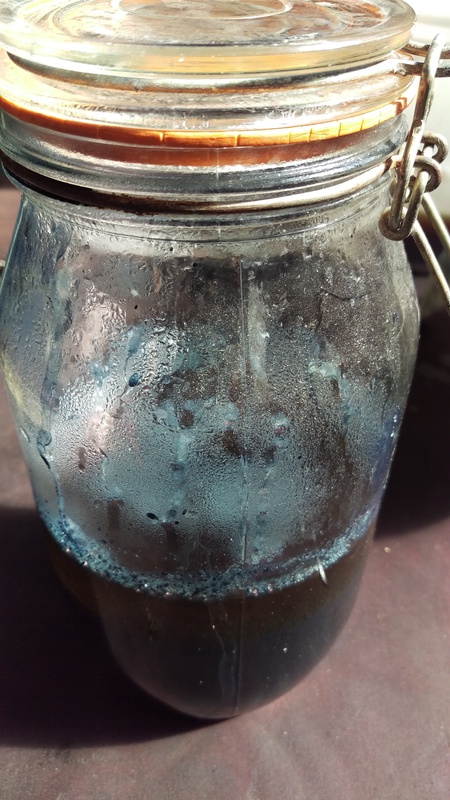 I changed the container I was using for my vat and my strategy for keeping it at suitable temperatures, using ideas gleaned from Jenai and some creative problem solving. I prepared my materials for dyeing properly. Yes, that’s my reflection with the hat, looming over my soaking materials. In short–success! And even better than that, I dyed over three days and returned the vat to happiness (technical language, this) after that as well. I’d run out of fructose so decided to experiment with honey. My beloved is on a low fructose diet so the fruits, vegetables and substances that contain most fructose have been quite a study at our house. 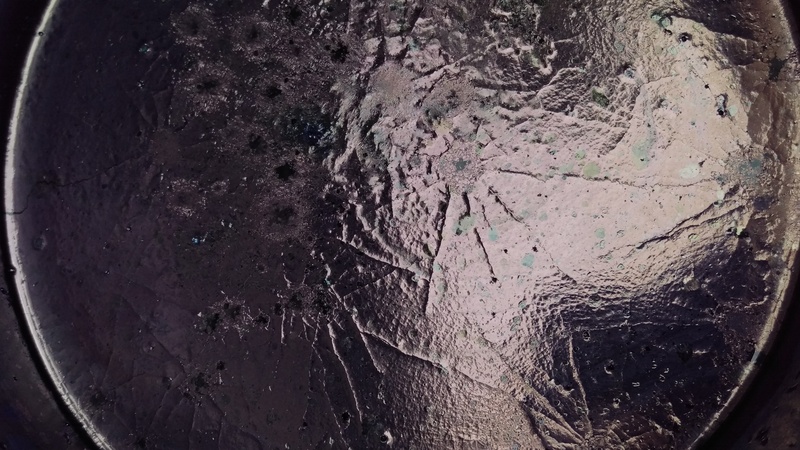 Nevertheless, guessing is necessarily involved and I’ll have to do this again to be confident I understand what is taking place and can reproduce it. A friend brought a large scarf over and that had a very successful dyeing on the first really good day for dyeing in the vat. I dyed a cotton scarf I brought home from Allansford too (it was white when I left Allansford). I did a lot better on achieving a nice deep blue than I did before the workshop, and I was in no doubt extra dips deepened the colour, which had been something I felt didn’t always happen previously. 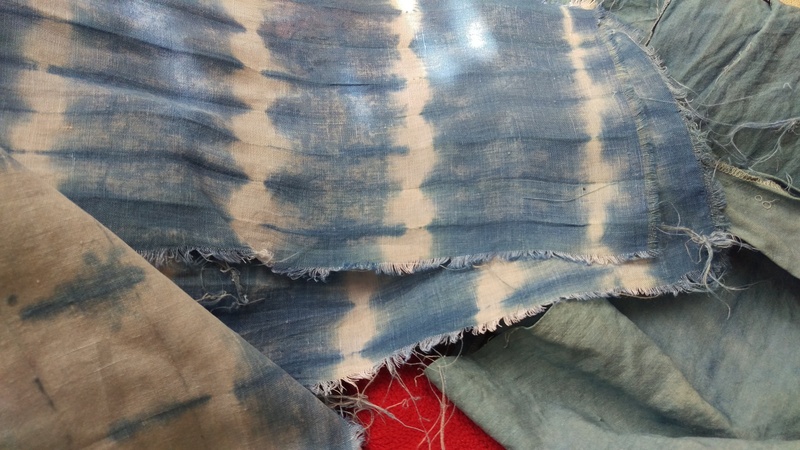 As usual, I treated this whole process as an experiment which meant I dyed all kinds of bits and bobs of pre loved linen, overdyed things I thought could bear improvement, and dyed some bags, because bags. 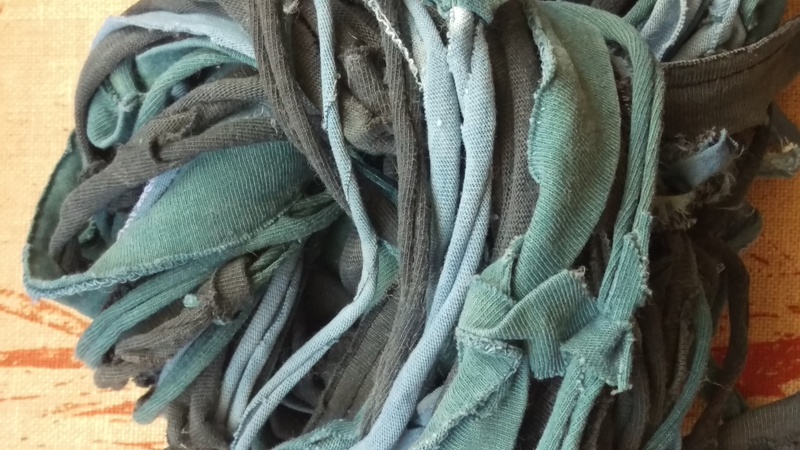 I cut out a pair of shorts from three tired old T-shirts headed for the rag bag and overdyed the pieces. 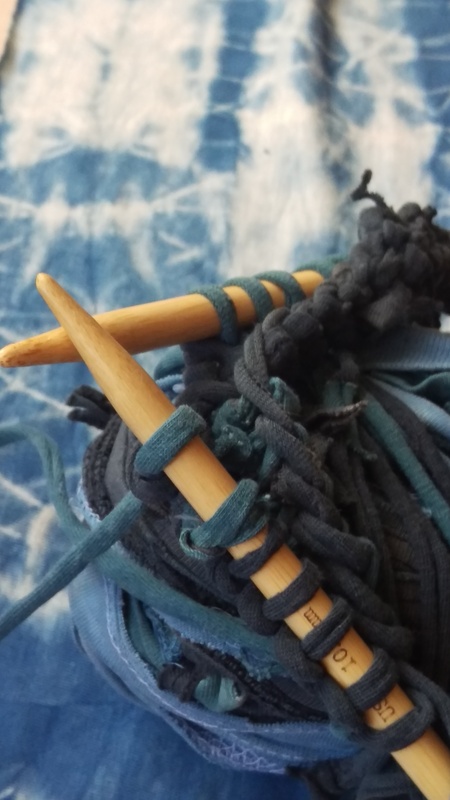 Finally, as the vat seemed to be exhausting, I turned the leftover t-shirt strips into yarn and overdyed them too. So–success! I have definitely learned something about the fructose vat. 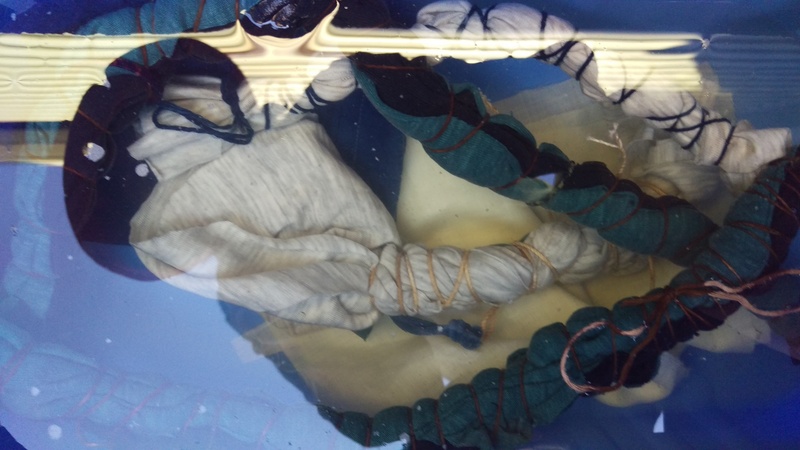 I know more about strategies for tyng and clamping fabrics for dyeing, even if I am still a beginner. Whoooo hoooo! Congratulations. They all looke really beautiful. Thank you so much, Keryn! I love the knitting yarn at the end. Very creative! Thanks! Organic processes are the way to go. But yes! Complicated too! Great to see the Allansford experience repeated at your place, I am sure indigo socks would be great. Thanks, Rhonda! I don’t think I could ever repeat the Allansford experience without the wonderful company and the beach nearby… but this was fun just the same 🙂 lovely to hear from you! You may have heard this before….. “The Respect of the Indigo Goddess must be earned” I have discovered that to mean a respect for the rich history, botany, chemistry of Indigo. Staying present to and appreciating the magic and beauty of the process as well as the finished cloth/yarn. With all that said, it is Persistence that will eventually win her over. I look forward to more of your victory posts. Love your work!